NEVER FADE, the second novel in The Darkest Minds trilogy, actually picks up 6 months after the end of The Darkest Minds. 17-year old Ruby Daly never thought she would train to be a soldier, or go on rescue missions, or become a designated leader. She was just lucky to be rescued, and given a chance that a lot of others can only dream about. But, she has. Now, Ruby finds herself not only training hard, but also using her psionic abilities to ferret out the truth from agents, and those the Children's League brings in. Bracken recreated the US into a place where a horrible virus forever changed America's children. Those who survived the disease were left with unnatural powers that could only be described by a color: the greens (super intelligent), the blues (telepathic), the yellows (control over electricity), the oranges (power over the mind), and the reds (control fire). Ruby is an orange, and a very dangerous one at that. Bracken's President Gray is a ruthless leader who doesn't mind putting anyone from age 7 years on up to 18 into so called rehabilitation camps where, like Ruby who spent 6 years in Thurmond, linger for years without any hopes of ever getting out. He doesn't tolerate rebellion, and yet that is exactly what the Children's Network does while it's also supposed to be rescuing children from the camps. With a new story, comes Ruby's new mantra which is Accept, adapt, act. But, when she finds herself in the middle of a political game of chance, she and her teammates Vida and Jude, travel to the east coast searching for Liam Stewart and even more intriguing surprises that pop up along the way. What's interesting about Ruby this time out, is that she actually grows as a character and becomes more in-tuned with her abilities. She still struggles with the right or wrong aspects of using them, but that's because she refuses to become a monster like one Chancy Gray. I also liked her relationship with Cat Conner, who helped her escape from Thurmond, and chose her to become the leader of the psionic children. Another character I liked in NEVER FADE, is Vida who is about as sarcastic and sassy as you can be without driving someone up the wall. I was also happy that Liam and Chubs once again make appearances, and to say that things have changed a whole lot for both characters, is an understatement. Unfortunately, Suzume (Zu) is not around at all. The hope is that she still alive, but I guess we'll have to wait until the final installment to find out. 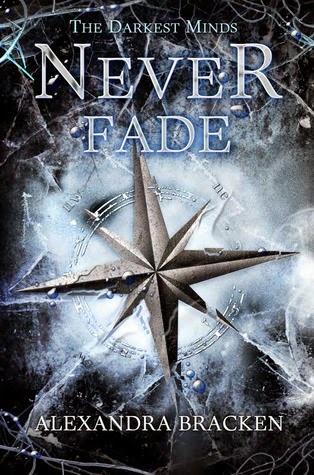 NEVER FADE ends on a really emotionally charged cliffhanger that leaves everyone shocked to the core and scrambling to figure out what happens next. I can't say I that I wasn't surprised that this would happen with all the political moves, and counter-moves, but not to this character. One of the most nerve wrecking part of this story is Liam and Ruby’s romance/friendship which is like watching two lightweight boxes duking it out. They both need to leave their egos at the door, and just over themselves! I have heard so many good things about this series that I have actually purchased all the books, now I just need to actually read them LOL! Thank you! Just finished the final book as well, hopefully that review will be up shortly as well! THe romance sounds a bit frustrating. I have heard great things about this series. Yikes. I cliffie, good thing the next book is already out. I totally agree Heidi! I'm glad that I was able to read it so soon after finishing Never Fade! Oh authors and those cliffies! lol Glad you're able to get to the next one now. Sounds like a stunning end to this one. That's a fact! Good thing the series wraps up In The Afterlight! I'm not sure I remember what book 1 is but it sounds interesting and it's great to see that this sequel shows you the evolution of the characters like that. thank you for the review! I really loved The Darkest Minds, so super excited for the second book myself! I'm hoping to post my review for the final book soon! Bracken is definitely creative writer.